Andretti Autosport is an auto racing team that competes in the IndyCar Series, Indy Lights, the FIA Formula E Championship and the Americas Rallycross Championship. It is headed and owned up by former CART series champion Michael Andretti. Andretti Autosport has won the Indianapolis 500 five times (2005, 2007, 2014, 2016, 2017) and the IndyCar Series championship four times (2004, 2005, 2007, 2012). The team has won the Indy Lights championship in 2008, 2009 and 2018. Additionally the team has won the GRC Championship with Scott Speed in 2015, 2016 and 2017. During the team's early formative years as Team Green, they won both the Indianapolis 500 and CART Championship in 1995. The team was founded in 1993 by Barry Green and Gerald Forsythe as Forsythe Green Racing. Forsythe had previously competed in the CART series during the early 1980s under the Forsythe Racing banner, and had achieved moderate success. The new team fielded two Atlantics entries for Claude Bourbonnais and Jacques Villeneuve during the 1993 season. In 1994, the team moved up to the CART series with Villeneuve as driver. The team scored a second place at the 1994 Indianapolis 500 and Villeneuve won one race as a rookie later in the season at Road America. For 1995, Green and Forsythe parted ways, and Barry Green renamed the outfit Team Green, with his brother Kim Green joining as team manager. The team won the 1995 Indianapolis 500 and 1995 CART championship with driver Jacques Villeneuve. In 1996, the team became known as the Brahma Sports Team for a season, with driver Raul Boesel. In 1997, Parker Johnstone took over the seat, and KOOL cigarettes came on board as major sponsor. The team became known as Team KOOL Green, and expanded to a two-car effort in 1998 with Paul Tracy and rising star Dario Franchitti. The two stayed on as teammates for five seasons. In 2001, Michael Andretti joined the organization as a satellite team headed by Kim Green, known as Team Motorola. In addition to running the CART schedule, Andretti entered the 2001 Indianapolis 500. Andretti and Green competed at Indy for the first time after a five-year absence, due to the ongoing open wheel "split." Andretti won his last race as a driver at the 2002 Grand Prix of Long Beach. In 2002, the team switched from Reynard to Lola chassis, producing a striking new livery to coincide with the change. In 2002, both Tracy and Franchitti joined Andretti to race at the Indianapolis 500. Due to the MSA, however, primary sponsor KOOL could not appear on the cars, and associate sponsor 7-Eleven was on the sidepods instead. Tracy placed second in a highly controversial finish. The team protested the results, and a lengthy and contentious appeals process dragged on into the summer. Ultimately, Green lost the appeal, to considerable disappointment and at considerable expense. After major problems in CART surfaced, Andretti, who had purchased majority interest in the team, switched the newly renamed Andretti Green Racing in 2003 to the rival IndyCar Series. Tracy left the team to stay in the Champ Car World Series, with Tony Kanaan joining Franchitti and Andretti. Andretti retired after the 2003 Indianapolis 500, and Dan Wheldon took his place. AGR ran four cars since the beginning of 2004, with Bryan Herta behind the wheel of the additional car. At the 2005 Grand Prix of St. Petersburg, AGR had all 4 drivers finishing 1st, 2nd, 3rd and 4th; Wheldon led home Kanaan, Franchitti and Herta to round out the top 4. Kanaan and Wheldon won consecutive IndyCar Series Championships in 2004 and 2005, with Wheldon winning the 2005 Indianapolis 500. Andretti referred to the win as his very own, as good as if he had won it as a driver, because of the nuances of car ownership and building his own team. Wheldon's championship was his only one before free agency, and joining Target Chip Ganassi Racing in 2006. He was replaced by Michael's son, Marco Andretti. Michael Andretti came out of retirement to qualify for the 2006 Indianapolis 500 to race with his son. The Andrettis finished second and third in "the 500" with Marco being passed just prior to the finish by Sam Hornish, Jr. in the second closest finish in race history. From 2001 to 2010, the team had seen at least one of their drivers finish within the top three at the race. It was announced on July 25, 2006, that Danica Patrick would join the team for the 2007 IndyCar Series season to replace Herta, who was being transferred to AGR's new American Le Mans Series Acura LMP2 effort. In October 2007, after winning the 2007 Indianapolis 500 and 2007 Indy Racing League championship, Franchitti announced his departure from the team to pursue a full-time career in the NASCAR Sprint Cup with Chip Ganassi Racing. Later that month, Hideki Mutoh was announced as his replacement in the 27 car. Mutoh was the runner up in the 2007 Indy Pro Series season. The 2008 IndyCar driver lineup returned to the team in 2009. However, for the first time since 2003, the team failed to win a race. Danica Patrick was the team's leading driver finishing 5th in points. Kanaan finished 6th with three podium finishes. The team repeated their Indy Lights championship, this time with American driver J. R. Hildebrand. On September 25, 2009, the Indianapolis Star reported that Danica Patrick had signed a contract to stay with Andretti Green and the IndyCar Series through 2012. On November 24, 2009, Andretti Green Racing announced that the team restructuring was complete, and the team would be renamed Andretti Autosport with Michael Andretti as the sole owner. It was announced on January 4, 2010 that Ryan Hunter-Reay would join the team, replacing Hideki Mutoh. Hunter-Reay earned the team its first victory since 2008 by winning the Grand Prix of Long Beach. Kanaan picked up the team's second win of the season at Iowa. Kanaan and Hunter-Reay led the team in the points standings, finishing 6th and 7th. Following the 2010 season, veteran driver Tony Kanaan was released from the team due to the lack of sponsorship. Kanaan later signed with KV Racing Technology. It was announced that the team’s other three drivers – Hunter-Reay, Andretti, and Patrick – would return for the 2011 season. Hunter-Reay was signed to a two-year contract through 2012. The 2011 season marked a return to the victory circle for Andretti Autosport, with Mike Conway winning at Long Beach, Marco Andretti ending a personal 79 race winless drought with his second career win at Iowa, and Ryan Hunter-Reay winning at New Hampshire. Disaster struck at Indianapolis when Mike Conway failed to qualify and Marco Andretti was forced to bump teammate Ryan Hunter-Reay from the final spot in the field, forcing Michael Andretti to purchase the already qualified spot of A. J. Foyt Enterprises driver Bruno Junqueira to meet Hunter-Reay's sponsorship commitments. In August 2011, Danica Patrick announced her departure from the IndyCar Series to move to NASCAR for the 2012 season; Patrick ran a full-schedule of Nationwide Series events and a limited schedule in the Sprint Cup Series. At the completion of the 2011 season, Dan Wheldon was due to sign a contract to return to the team in 2012 in the car vacated by Patrick. He was killed in an accident during the season-ending 2011 IZOD IndyCar World Championship, leaving the future of the #7 GoDaddy team uncertain. In January it was announced that 2011 IndyCar rookie of the year James Hinchcliffe would drive the GoDaddy car renumbered to #27. 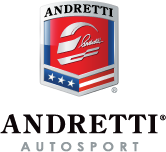 In 2012, rumors started that Andretti Autosport would expand to NASCAR's Sprint Cup Series competition in 2013. Jayski's Silly Season Site stated that Andretti Autosport would field a single car team in the Cup Series in 2013 with Dodge as the manufacturer. Two days later, Dodge reported that there was no deal with Andretti or any team for the 2013 Season. In addition to Patrick being replaced by Hinchcliffe, Mike Conway was not brought back for the 2012 season, leaving the team with three full-time cars. Two additional drivers, Sebastián Saavedra and Ana Beatriz were signed for three and two races respectively, including the Indy 500. With Honda no longer the sole engine supplier for the series, a deal was reached with Chevrolet to provide engines for the team. The team's three drivers qualified second, third and fourth for the 500, however the race itself proved a disappointment with only Hinchcliffe completing the full 200 laps, finishing sixth. The eighth race of the season at the Milwaukee Mile would be won by Hunter-Reay, his third podium finish of the year. Hunter-Reay would go on to win three races in a row, adding victories at Iowa and Toronto. A fourth victory in the second to last race of the season at Baltimore left Hunter-Reay as the only challenger to Will Power for the series championship. Power, whose title had seemed inevitable after dominating the road and street courses early in the season, still had a 17-point lead. On lap 66, with Power and Hunter-Reay racing side by side, Power spun, narrowly missing Hunter-Reay's car, and went hard into the outer wall. Hunter-Reay would finish in fourth to win the championship. The three main drivers for the team, Andretti, Hunter-Reay and Hinchcliffe, all returned for 2013. In addition, E. J. Viso was added as a fourth car for the season, in conjunction with HVM Racing. Rookie driver Carlos Muñoz would also drive an entry for the team in the Indy 500. Muñoz and Zach Veach would be the team's drivers in the lower level Indy Lights series. Andretti would also have entries in the Pro Mazda Championship and the U.S. F2000 National Championship, the feeder series to IndyCar (the "Road to Indy"). The season started strong as Hinchcliffe won the season's first race, the Grand Prix of St. Petersburg, his first IndyCar series victory. In the second race, the Grand Prix of Alabama, Hinchcliffe suffered a breakdown and would be stuck on the side for most of the race watching teammate Hunter-Reay go on to victory to make the team two for two. The streak broke in week three, with both Hinchcliffe and Hunter-Reay exiting the race early. High and low would go on to be a theme for the team that season. Hinchcliffe would go on to win two more races, but a variety of mechanical problems would see him finish the year eighth. Hunter-Reay would have a similar season, winning two races but finishing the season a disappointing seventh following his 2012 championship. Conversely, Andretti would stay near the top of the standings for most of the season after starting by finishing no worse than 7th in seven of his first eight races, but after two early third-place finishes he would not see the podium the remainder of the year and finished the season in 5th place. Viso, meanwhile who came into the team with a reputation for being involved in collisions, showed flashes of success, including a fourth-place finish at Milwaukee, but had only two top ten finishes, a fifth and a ninth, in his final eight races, before dropping out of the season finale stating he had food poisoning. He was replaced for the race by Carlos Muñoz. Muñoz provided a thrill for the team in the Indy 500, taking second place in his first ever start in the IndyCar series and first time driving the DW12 car competitively. Andretti, Hunter-Reay, and Hinchcliffe were once again signed as primary drivers and the team once again began running with Honda power, although GoDaddy dropped their IndyCar sponsorship program and was replaced on the Hinchcliffe car by United Fiber & Data. Viso was not brought back, with Muñoz taking over as the driver of the fourth full-time car. In the 2014 Indianapolis 500, the team fielded a fifth car for NASCAR driver Kurt Busch, who attempted Double Duty. Busch and three of the four full-time Andretti Autosport drivers finished the Indianapolis 500 in the top six, including Hunter-Reay, who won the race. (The only exception was Hinchcliffe, who crashed with 25 laps to go while fighting for 2nd position.). However, Busch, who finished in 6th on the lead-lap, fell short of completing all 1,100 laps for Double Duty when his engine expired on lap 274 of the 2014 Coca-Cola 600. Andretti fielded a three-car full season effort in 2015 with Marco Andretti, Ryan Hunter-Reay and Carlos Muñoz. Additionally, Simona de Silvestro and Justin Wilson each joined for races throughout the season. In 2006, it was announced that AGR was selected by Honda Performance Development to be one of the official works teams for the new Acura LMP program in the American Le Mans Series. The team worked with Highcroft Racing on the development of the Courage LC75 chassis. The team debuted the newly renamed Acura ARX-01a at the 2007 12 Hours of Sebring. The AGR team finished second overall, and took the maiden LMP2 win for Acura with drivers Dario Franchitti, Marino Franchitti, Bryan Herta, and Tony Kanaan. However, during the remainder of the season the Porsche RS Spyders of Penske Racing regularly outpaced the Acuras. The team finished the season 5th in the LMP2 Teams' Championship. For the 2008 season the car was driven full-time by Herta and Christian Fittipaldi and occasionally driven by Kanaan at select longer distance events. the 2008 season saw fierce battles between the newly updated Acura ARX-01b, Porsche RS Spyders and the LMP1 Audi R10s. AGR claimed an overall victory at the Detroit race and finished the season with a class victory in the final race at Mazda Raceway Laguna Seca. The team finished the season 4th in the Teams' Championship. Acura discontinued their relationship with the team for the 2009 season due to mixed results. The team did not compete in 2009. Andretti Autosport announced on March 4, 2010 that they would begin competing in the U.S. F2000 National Championship when they signed Sage Karam. The team was looking for a teammate for Karam and announced on March 26, 2010 that they had signed Zach Veach to join him. The two have been very active on and off the racetrack. Karam won the 2010 points championship, Veach had 10 top-five finishes despite missing two events and the team secured the team championship for the 2010 season. Off the track, Karam has spoken at Operation Smile and Veach is working with Oprah Winfrey's No Phone Zone and FocusDriven as a spokesKID for both. In 2018, Andretti Autosport will enter the Australian Supercars Championship after purchasing a 37.5% shareholding in Walkinshaw Andretti United. ^ The Firestone Firehawk 600 was canceled after qualifying due to excessive g-forces on the drivers. ^ In conjunction with AFS Racing. ^ In conjunction with Conquest Racing. ^ In conjunction with Bryan Herta Autosport and Curb-Agajanian. ^ In conjunction with McLaren-Honda. ^ In conjunction with Michael Shank Racing. STP COTA IMS INDY ROA TOR MDO GAT POR LAG D.C. T.C. D.C. T.C. ^ In conjunction with Steinbrenner Racing. ^ "Danica to stay in IRL, but switch to Andretti Green". ESPN. ESPN Inc. Associated Press. July 25, 2006. Retrieved January 2, 2015. ^ "Report: Patrick re-signs with AGR". ESPN. ESPN Inc. Associated Press. September 25, 2009. Retrieved January 2, 2015. ^ "Ryan Hunter-Reay saps Power for IndyCar win at Long Beach". USA Today. Gannett Company. Associated Press. April 18, 2010. Retrieved January 2, 2015. ^ "Kanaan ends IndyCar losing streak in Iowa". Autoweek. Crain Communications. June 19, 2010. Retrieved January 2, 2015. ^ "Mike Conway wins Long Beach IndyCar GP to complete crash comeback". The Guardian. Guardian Media Group. Associated Press. April 18, 2011. Retrieved January 2, 2015. ^ Oreovicz, John (June 26, 2011). "A win-win for Marco Andretti, IndyCar". ESPN. ESPN Inc. Retrieved January 2, 2015. ^ "Ryan Hunter-Reay wins IndyCar race". ESPN. ESPN Inc. Associated Press. August 15, 2011. Retrieved January 2, 2015. ^ "Ryan Hunter-Reay in Indy 500". ESPN. ESPN Inc. Associated Press. May 23, 2011. Retrieved January 2, 2015. ^ Ryan, Nate (August 25, 2011). "Danica Patrick officially leaves IndyCar behind for NASCAR". USA Today. Gannett Company. Associated Press. Retrieved January 2, 2015. ^ Oreovicz, John (October 17, 2011). "Dan Wheldon's death stuns racing world". ESPN. ESPN Inc. Retrieved January 2, 2015. ^ "Andretti Autosport Signs Hinchcliffe to 2012 IndyCar Lineup". Andretti Autosport. Andretti Autosport Holding Company, Inc. January 11, 2012. Retrieved January 2, 2015. ^ Spencer, Lee (May 17, 2012). "Sources: Andretti could join Dodge lineup". Fox Sports. Retrieved 2012-05-17. ^ "Sources: Andretti is considering forming NASCAR team: UPDATES — Dodge and Penske deny deal". Jayski's Silly Season Site. ESPN Inc. Retrieved January 2, 2015. ^ Lewandowski, Dave (October 19, 2013). "Hinchcliffe back with AA; No. 27 gets new sponsor". IndyCar Series. IndyCar. Retrieved January 2, 2015. ^ Margolis, Bob (May 25, 2014). "Ryan Hunter-Reay's 2014 Indy 500 win caps off Andretti Autosports' dominant day". Bleacher Report. Turner Broadcasting System. Retrieved May 26, 2014. ^ "Acura Announces Three-Team 2007 ALMS Lineup". Honda Performance Development. Honda. July 20, 2006. Archived from the original on January 2, 2015. Retrieved January 2, 2015. ^ Stringfield, Ryan (March 4, 2010). "Sage Karam Signs with Andretti Autosport". Junior Open-Wheel Talent. Junior Open Wheel Talent LLC. Archived from the original on 2015-01-02. Retrieved January 2, 2015. ^ "Andretti adds to his USF2000 team". ESPN. ESPN Inc. Associated Press. March 26, 2010. Retrieved January 2, 2015. ^ "FocusDriven Announces Race Car Driver Zach Veach As Its National Spokesperson". FocusDriven.org. FocusDriven. June 29, 2010. Archived from the original on January 2, 2015. Retrieved January 2, 2015. ^ "Andretti, United Autosports complete Walkinshaw buy-in". Speedcafe. October 5, 2017. ^ "Walkinshaw Racing's $4.5 million windfall will be used to hunt down DJR Team Penske". The Daily Telegraph. October 7, 2017. ^ Beer, Matt (June 27, 2008). "Montagny joins Andretti Green". Autosport. Haymarket Publications. Retrieved January 2, 2015. ^ "Luca Forgeois joins USF2000 program for Mid-Ohio tripleheader". Andretti Autosport. Andretti Autosport Holding Company, Inc. July 26, 2013. Retrieved January 2, 2015. Wikimedia Commons has media related to Andretti Autosport. This page was last edited on 17 April 2019, at 18:37 (UTC).